Pomegranates, because of notoriety and marketing, have been heavily researched. This fruit truly lives up to its hype. They are a very good source of fiber, antioxidants and a host of vitamins and minerals. Regular inclusion of this fruit in diet boosts immune system, improves circulation, and offers protection from cancers. 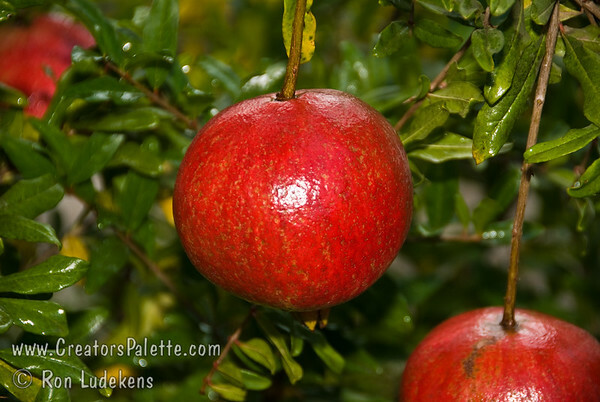 Ellagitannin compounds: Granatin B and Punicalagin are abundant in pomegranate juice. These compounds are effective in reducing heart disease by scavenging free radicals from the human body. Regular consumption of pomegranates have been found effective against prostrate cancer, BHP (benign prostatic hyperplasia), diabetes and lymphoma. The juice is very rich in essential B-complex vitamins, vitamin K, and minerals: calcium, copper, potassium and manganese. The information I am sharing is from a multitude of sources, and cultures over a wide time span. Neither L. E. Cooke Co. nor I as a representative assume any liability concerning the efficacy of the information shared. We do not suggest that any dietary protocols discussed are to replace conventional medical treatment or guarantee any results by their practice. We are nurserymen, not MDs, and proud of the trees we grow and the enhancements to life they provide.